When Catholics speak of Anglicans and sacramental invalidity, most people would assume that we're speaking of Holy Orders. 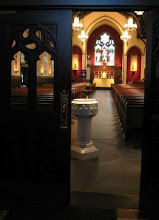 But there is another kind of sacramental invalidity which will make it impossible for many Anglicans, both lay and ordained, to be received into the Catholic Church through Anglicanorum coetibus or any other means, and that invalidity is in the Sacrament of Marriage. The Catholic Church believes that only Catholics are bound to marry in the Catholic Church (according to canonical form) and, therefore, that any two baptized Christians who consent to marry each other are by their exchange of consent creating between themselves the bond of sacramental marriage. (N.B. And this is despite the fact that Protestants generally do not count marriage as a sacrament, but there it is.) So, for example, if two Anglicans get married by any means (a judge, an Anglican minister, an Elvis chaplain at a Vegas wedding chapel), then they are bound to each other by the lifelong sacrament of matrimony. If that marriage ends in divorce, however, and one or both them marry again, then in the second relationship they are married only in civil law and do not have the sacrament of marriage because the existing prior bond is presumed by the law of the Church to continue to exist in the sacrament, even after the civil divorce. The only way to determine with moral certitude whether or not the first marriage was or was not a true sacrament of Christ and the Church is to allow an ecclesiastical court, or tribunal, to do a thorough investigation of the former marriage, which enjoys in law the presumption of validity. If sufficient evidence can be adduced to prove to moral certitude that the presumed sacrament never came into being, then the tribunal can declare that the former marriage was a civil contract only and not a sacrament, leaving the former partners free to marry in the Church as though for the first time. Significant numbers of Anglicans are now in their second or third marriage (or more), and until and unless each of their prior marriages is investigated by a tribunal of the Catholic Church, it is not possible to receive them into the Catholic Church. Because this matter is so little understood, it often comes as a great surprise to people who want to become Catholics but find the way is closed to them by living in an invalid marriage, and given how sensitive this matter is, the persons involved will often give many reasons other than the real reason for their decision not to become Catholics. Look for this to happen with great frequency in the coming days as the personal Ordinariate comes closer and closer in the United States. The reasons given for remaining Anglicans may very well not be the real reasons.